Construction on a vast improvement of the Texas Capitol complex in Austin is set to begin in earnest in December. The Texas Facilities Commission, which oversees state government buildings, was updated earlier this month by the general contractor Balfour Beatty on plans for the Capitol Mall. The master plan for the complex includes several distinct districts: courts, museum, mall, and agency. The mall will also create consolidated underground parking for agency staff. As the project begins, there will be digging by day and hauling by night for the garage to be built underneath Congress Avenue between the Capitol building and the Blanton Museum. The first phase of the Capitol Complex Master Plan is the construction of the Texas Mall, with five levels of underground parking, plus the addition of two new state office buildings. Package #1, the preliminary excavation of the two office buildings and Congress Avenue, has had some delays due to rain, but is generally on schedule for completion. Current excavation is on the 1801 Congress building site, which should be completed by next May. Excavation on 1601 Congress begins next February and be completed by August. Fencing goes up on Congress Avenue permanently between the Capitol and Martin Luther King Boulevard on Dec. 1. No one will be able to cross Congress on 16th, 17th or 18th streets until the Texas Mall is completed in May of 2022. Package #2 is all the relocation and expansion of utility work for the Capitol Complex. That has gone out for bid and the Texas Facilities Commission is seeking a second set of bids. The move of the Capitol Complex’s Central Utility Plant is now moved to Package #3. The original location was the Sam Houston Building, but Austin Energy could not power to expanded demand. So now the site is moved to Colorado Street, between 17th and 18th streets, which was originally slated for a shorter office building because of the Capitol View Corridors. Package #3 Relocating the Central Utility Plan, or CUP, to the Colorado location will cut the length of piping and reduce the cost on the plant. Austin Energy has agreed to upgrade switching gear in the area so that not just one, but two, CUPs can be located in the area. Package 4 is the 14-story 600,000-sf office building with a ground-floor cultural venue at 1801 Congress. Occupants will include the relocated DPS office and the Texas Lottery Commission. The contractor will begin drilling piers in July 2019, with a goal to finish in May 2022. Package 5 is the 12-story 400,000-sf office building at 1601 Congress with a first-floor food service venue. The Capitol’s child care center will be located in this building. Design documents are completed on both buildings. Construction documents on both towers will be filed in January, Saksen said. Package 6 is the $76.1 million Texas Mall and underground parking. Kirksey is the architect on the project and White Construction is the contractor. Design will begin early next year. Completion will coincide with the opening of the office buildings in 2022. 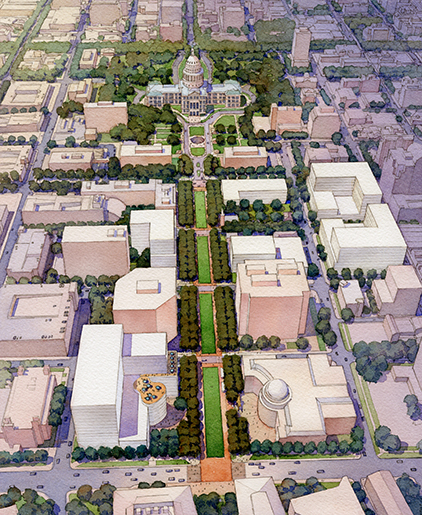 Check out the full renderings  of the Texas Capitol Mall.